Much of what we know about pain physiology rests on studies of animal models or cells in a dish. While these approaches have produced a windfall of data, they have not led to many clinical successes. Researchers widely agree that studies in human neurons will be required to make the leap to new pain medications. Last week, the field got closer with two reports of human fibroblast-derived neurons that in many ways approximate native human nociceptors. The studies, one led by Clifford Woolf and Kevin Eggan at Boston Children’s Hospital and Harvard University, Cambridge, US, and the other by Kristin Baldwin at The Scripps Research Institute, La Jolla, US, appeared online in Nature Neuroscience on November 24. Many previous efforts to create customized human cells, including nociceptors, started with stem cells—either derived from fetal tissue or induced pluripotent stem cells made from other adult cells. In the two new papers, the researchers directly reprogrammed easy-to-obtain skin fibroblasts into neuronal cells by enforced expression of lineage-determining transcription factors. Direct reprogramming promises to streamline production of induced nociceptors for future study. M. William Lensch, executive director of the Harvard University Department of Stem Cell and Regenerative Biology (HSCRB), Boston, US, summed up the problem facing researchers: “You can try to recapitulate the native cells, or you can try to get your hands on them, and it’s pretty hard to get your hands on these cells. What you would really like to have is a basket full of human sensory neurons, and this work is a good step in the right direction.” Although several authors are affiliated with HSCRB, Lensch was not involved in either study. In the Woolf group, Elizabeth Buttermore was co-first author with Brian Wainger. “We want to model pain and peripheral neuropathy in vitro. The goal is to have better model systems at the preclinical level that might translate to better clinical success,” Buttermore told PRF. Because they were most interested in nociceptors, the Woolf group used a strategy to optimize production of neurons that express the painful heat-sensing transient receptor potential vanilloid type 1 (TRPV1) channel. The researchers first created mice in which TRPV1-expressing neurons were marked with the red fluorescent reporter protein tdTomato. Then, they transfected fibroblasts from the tdTomato mice with different combinations of neuronal and nociceptor lineage transcription factors, and settled on a set of five that resulted in the highest levels of TRPV1-expressing neurons in culture. About a third of the neurons they generated carried the tdTomato marker. In Baldwin’s group, co-first authors Joel Blanchard and Kevin Eade aimed for a wider population of sensory neurons by inducibly expressing just two sensory neuron lineage transcription factors for seven days in mouse fibroblasts. Somewhat surprisingly, this simple approach yielded a diverse population of neurons that appeared to comprise the three major classes of sensory neurons—nociceptors, mechanosensors, and proprioceptors. Importantly, although both groups began by generating nociceptors from mouse cells, they each succeeded in applying their techniques to human fibroblasts as well. These are not the first attempts—or successes—to create human sensory neurons in a dish. In 2012, Lorenz Studer’s group made functional nociceptor-like cells from human pluripotent stem cells by treating them with a cocktail of small-molecule inhibitors (and see PRF related news story on Chambers et al., 2012, and also Young et al., 2014). Earlier studies had pioneered the direct-reprogramming strategy to transform human fibroblasts into various types of neurons (e.g., Pang et al., 2011; Pfisterer et al., 2011; and see PRF related news brief). In both of the new studies, the induced cells looked and acted like sensory neurons: they stained positive for markers of excitatory neurons and grew axon-like processes. Baldwin’s neurons even displayed the emblematic pseudo-unipolar morphology of sensory neurons from the dorsal root ganglia (DRG), in which a single short process extends from the cell body and then bifurcates, with one branch reaching into the spinal cord and the other extending to the area of innervation. This was surprising, because native DRG neurons in culture lose their pseudo-unipolar morphology. 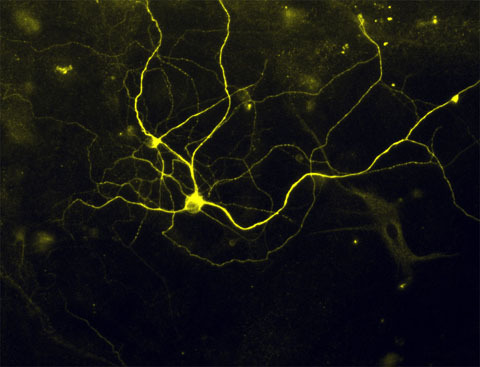 Baldwin was also surprised by her finding that about one-third of the neurons each expressed one of the growth factor receptors TrkA, TrkB, or TrkC, which are markers for the three functional classes of sensory neurons. Dib-Hajj called it “remarkable that they seem to have recreated the different modalities of neurons that contain TrkA, B, or C.” The researchers focused their functional characterization on one-third of their population: the nociceptor-like TrkA-positive cells. Next, the teams both used calcium imaging to show that induced neurons expressed functional TRPV1, TRPM8, and TRPA1, molecular sensors of heat, cold, and noxious chemical stimuli, respectively. When the researchers bath-applied agonists of each TRP channel—including capsaicin, menthol, and mustard oil—subsets of cells responded with transient calcium fluxes, similar to nociceptors. In addition, Baldwin’s group found that their nociceptor-like cells responded to substances that provoke itch: histamine, chloroquine, and pruritic peptides. The Woolf group further showed that in their tdTomato-positive neurons, not only ion channels but also their downstream signaling pathways were intact. Like nociceptors, tdTomato-positive neurons released calcitonin gene-related peptide (CGRP) in response to depolarization. The cells also demonstrated heightened responses to capsaicin following pretreatment with prostaglandin E2 (PGE2), an inflammatory mediator, or oxaliplatin, a chemotherapeutic drug, both known to sensitize nociceptors and amplify pain signaling. 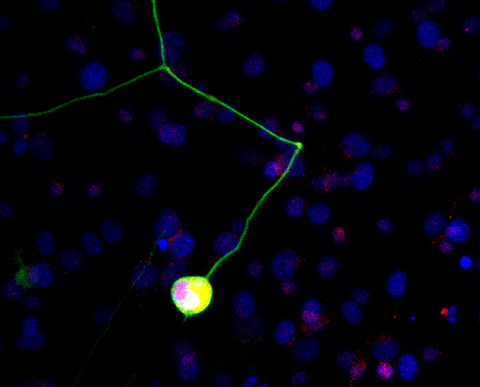 In a final example of the technique’s application to human disease, Woolf’s team also created sensory neurons from fibroblasts of patients with familial dysautonomia (FD), a rare, fatal disease that causes degeneration of sensory and autonomic nerves. The induced neurons revealed a new genetic detail about the nature of the disease: that in heterozygous patients, only the “bad” splice variant of the disease gene is expressed in neurons, whereas both variants appear in other somatic cells. Baldwin was also surprised by her finding that about one third of the neurons each expressed one of the growth-factor receptors TrkA, TrkB or TrkC, which are markers for the three functional classes of sensory neurons. Image: Clumps of induced human sensory neurons. Credit: Kevin Eade, The Scripps Research Institute. Selective conversion of fibroblasts into peripheral sensory neurons. Nat Neurosci. 2015 Jan; 18(1):25-35. Epub 2014 Nov 24. Nat Neurosci. 2015 Jan; 18(1):17-24. Epub 2014 Nov 24. Human pain in a dish: native DRG neurons and differentiated pluripotent stem cells. Characterizing human stem cell-derived sensory neurons at the single-cell level reveals their ion channel expression and utility in pain research.